Big Shiny Very Barrie Colts Tunes - Suggested Player Intros and Goal Songs. - Very Barrie Colts | A website covering the Barrie Colts of the OHL. Home Barrie Colts blog music OHL Big Shiny Very Barrie Colts Tunes - Suggested Player Intros and Goal Songs. Big Shiny Very Barrie Colts Tunes - Suggested Player Intros and Goal Songs. The Barrie Colts are getting a new scoreboard. Staff at the Barrie Molson Centre are currently setting it up before they raise it to the rafters of the arena. Contributors of the blog discussed other things that the team could do to change things up at games and a hot topic was music played at games. After a long discussion, Ryan Noble, Ryan McArthur and Justin Stapleton decided they would make their own picks for a new player intro theme, as well as a goal song. 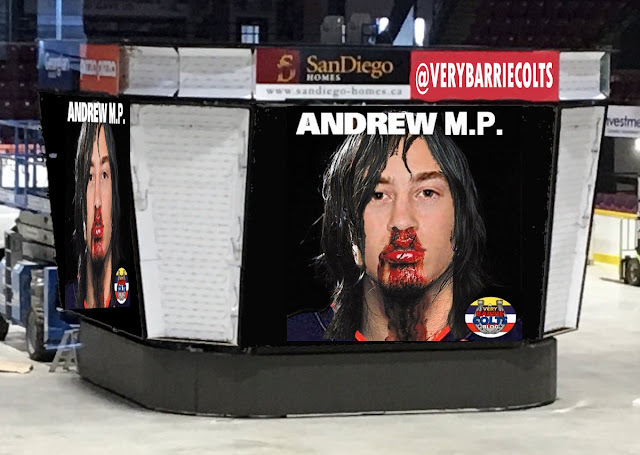 There is no shock as to where Ryan Noble went with his goal song, he has been pushing the Colts to make the goal song Party Hard by Andrew W.K since the blog launched in 2014. Here are the suggestions made by the three contributors. What songs would you like to see the team use for player introduction and goals? Let us know in the comments or on social media and we will share your suggestions!